“This is why arts are so important in the public school system,” says Anthony Ramos, a star of "Hamilton." 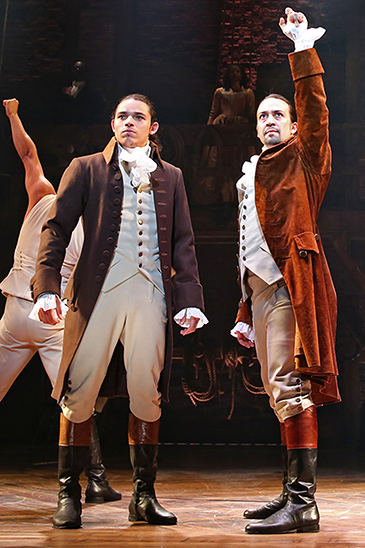 Joan MarcusAnthony Ramos (front, left), one of the stars of the Broadway musical "Hamilton," on stage with actor Lin-Manuel Miranda during a performance. As one of the stars of “Hamilton,” the Broadway phenomenon about the life of founding father Alexander Hamilton, Anthony Ramos has performed for celebrities from Beyoncé to Barack Obama. But he reserves his highest acclaim for someone else: the high school theater teacher who guided him toward a career he had never even dreamed of having. Steinweiss founded New Utrecht’s theater program as a high school senior there in 1994. Six years later, she returned to her alma mater as an English teacher with an unshakable belief in the importance of the arts. Steinweiss nurtured New Utrecht’s after-school theater program as a haven for all students looking for a place to fit in. “It became the heart and soul of the school,” she says. In 2008, on a bit of a lark, a star player on the New Utrecht baseball team named Anthony Ramos auditioned for the school’s SING production and immediately caught Steinweiss’ attention. At Steinweiss’ urging — “I pretty much didn’t give him a choice,” she says — Ramos was soon juggling baseball practice and a starring role in New Utrecht’s musical. In his senior year, when his plans to play NCAA baseball in college fell through, Ramos found himself at a crossroads. Steinweiss sat with Ramos and helped him complete his application for the American Musical and Dramatic Academy, an intensive two-year performing arts conservatory in Manhattan. When Ramos balked at the $50 application fee, Steinweiss wrote out the check. Ramos was accepted. But he soon faced another hurdle: the steep cost of tuition. Drawing on a previous connection with a scholarship organization founded by Jerry Seinfeld, Steinweiss made a call and arranged a meeting for Ramos — who was soon awarded a full scholarship and graduated from the program. At an open casting call, the 23-year-old Ramos was cast in “Hamilton” in the dual role of Revolutionary War soldier John Laurens and Alexander Hamilton’s son Philip — and soon found himself vaulted into Broadway history. 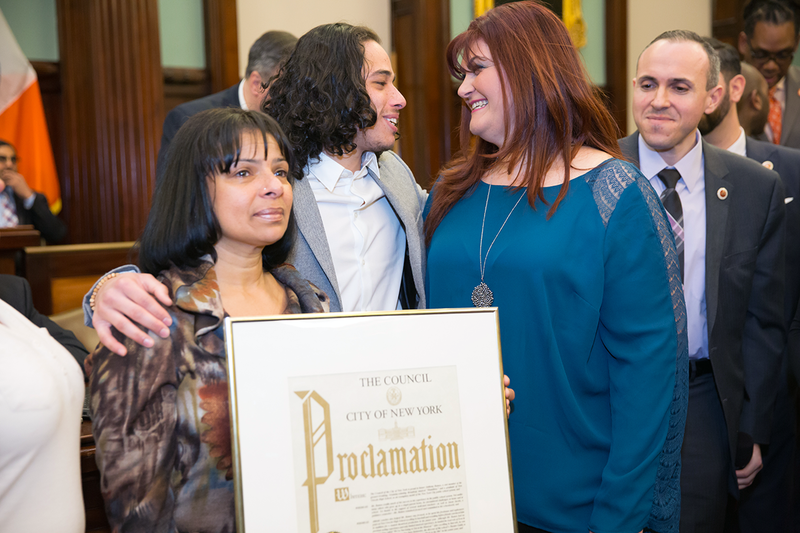 Erica BergerRamos (center) celebrates with Steinweiss (right) and his mother Mildred Ramos (left) after being honored with a proclamation by the City Council and Councilmember Mark Treyger (background, right). “He allowed me to open doors for him, and he walked through them,” says Steinweiss. New Utrecht’s theater program opened similar doors for thousands of students during Steinweiss’ decade at the school. But in 2011, during the Bloomberg era, the program was cut for budgetary reasons, leading a discouraged Steinweiss to resign. “Education got so far away from where it should have been,” she says. But both Ramos and Steinweiss are cautiously optimistic that — perhaps thanks in some small part to the success of “Hamilton” — arts education is reclaiming its place in New York City public schools.